When building an instance model from a predefined Class model, Enterprise Architect can assist in setting classifiers and role names for objects involved in a relationship. For example, if ClassA has association relationships with ClassB and ClassC, you can create an instance of ClassA (ObjectA), then draw an association to a new unclassified object and have the choice of selecting ClassB or ClassC as the classifiers of the new object. Where you have an existing association between a classified object and an unclassified object, use either method outlined here, to display the 'Choose an Association' dialog. Displays the name (if defined) of each Association connector issuing from the source object's classifier. If the connector has no name, the value <anonymous> displays. Represents the source and target classifier elements in each Association connector issuing from the source object's classifier. If you select one of these, the target classifier becomes the classifier for the target object element. Select <none> if you want to create the Association, but not based on the classifier relationships. Identifies any Roles defined in the Association for the source classifier element, according to the source role multiplicity setting; if you select one of these roles, this will become the specific Role for the source object, as shown on the name of the element on the diagram. If the multiplicity is not set, or the upper bound is * (asterisk), just the role name displays in the list. 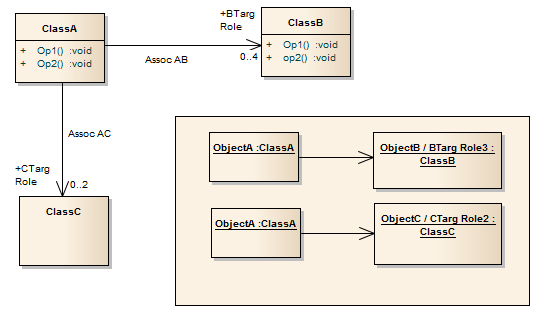 Identifies any Roles defined in the Association for the target classifier, according to the target role multiplicity setting; if you select one of these roles, it will become the specific Role for the target object as shown on the name of the element in the diagram (and on the 'Binding' page of the Association connector 'Properties' dialog). If you selected the <none> entry, a simple Association is created and the target object is unclassified. Cancel the dialog without changing any classifier settings.